Say farewell to a beloved friend, family member or business associate with a serene blend of white and blue blossoms, reminiscent of the peaceful sea. 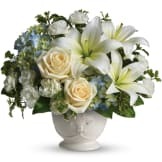 This charming bouquet of Tranquil Seas flowers - hand-delivered in a classic urn - will be a thoughtful reminder of your devotion. 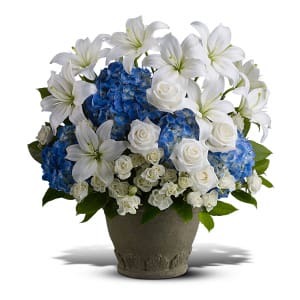 • A mix of fresh blue and white flowers such as roses, Asiatic lilies and hydrangea is delivered in Grecian Garden urn. 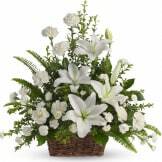 Flowers will be received by a Stubbs-Conner Funeral Home & Cremation Services' staff. 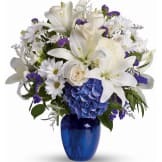 All of our flowers are designed and delivered by hand from a local florist in in Waynesville.